Before you try elephant pose, stretch and relax your arms, shoulders & hands with ‘elephant ears’. Sit or stand up tall and place your hands on your waist. Then, keeping your hands on your waist, slowly roll your shoulders backwards and outwards, to stretch out your lower neck and upper chest muscles. To increase the stretch, try doing slightly bigger shoulder rolls. Do about 3 or 4 shoulder rolls backwards and outwards then do one shoulder roll in the opposite direction i.e. forwards and inwards. Finish by taking your hands off your waist and giving your shoulders, arms and hands a gentle shake. Now it is your child’s turn to join in and make their own elephant ears as you did. Note to parents: Try to do elephant pose with your child, but remember to look after your own body. If you have concerns about doing the pose always check with a health professional first. Never continue with the pose if it is uncomfortable. Find a space on the carpet or mat with your child. Make sure you have plenty of room around you both to bend, stretch and wave your arms. Go barefoot to prevent slips and to help your child feel the floor more accurately. Stand up with your feet hip width apart. Encourage your child to copy you. 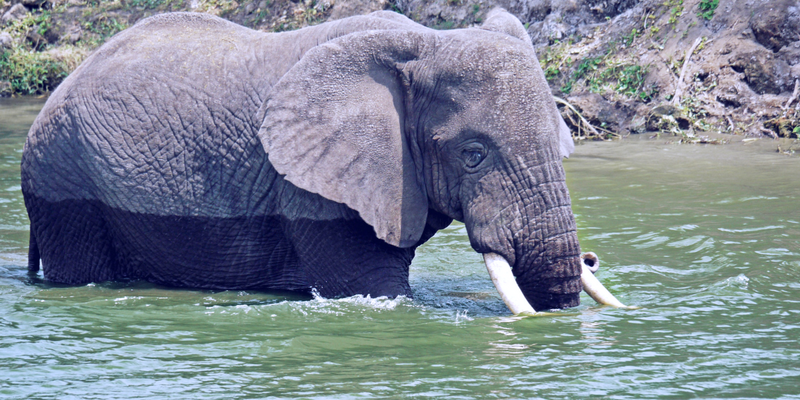 Do a few stomps with your feet on the mat, like heavy elephants. This is a great balance activity. The slower your child stomps, the more they will be standing on one leg. Stretch one arm up above your head, with your upper arm close to your cheek. This is your ‘trunk’. Bend forward from the waist, keeping your arm in position, so it’s now hanging down in front of you, like an elephant’s trunk. Place your other arm behind your back, resting your hand on your lower back. Slowly start to sway your body. Then wave your outstretched arm (trunk) from side to side at the same time. Once again, encourage your child to copy. As your child waves their arm and hand across their body they will be crossing their mid-line. After a few sways from side to side, straighten up and reach your arm up high above your head to trumpet like an elephant. Repeat the pose using the other arm. 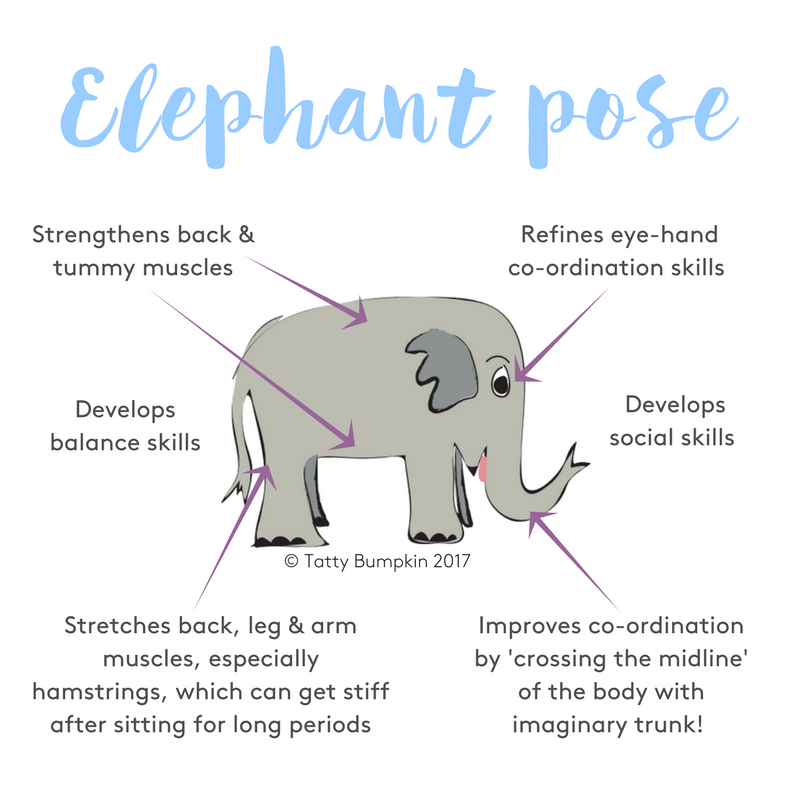 Elephant pose is a great activity to do with your young child after they have been sitting in a car seat for a while, where they have not been able to fully stretch out. The ‘Elephant Ears’ stretch will give you both the chance to stretch out your neck and chest muscles. As you both move in elephant pose, your child and you will be strengthening your tummy muscles, as you bend forward. And you will be strengthening your back muscles as your straighten up. As your child waves their blue streamer up and down and in and out of the bucket in elephant pose – they will be developing their eye-hand co-ordination. It is important to develop visual skills early on, as they provide the foundations for activities such as reading and writing. 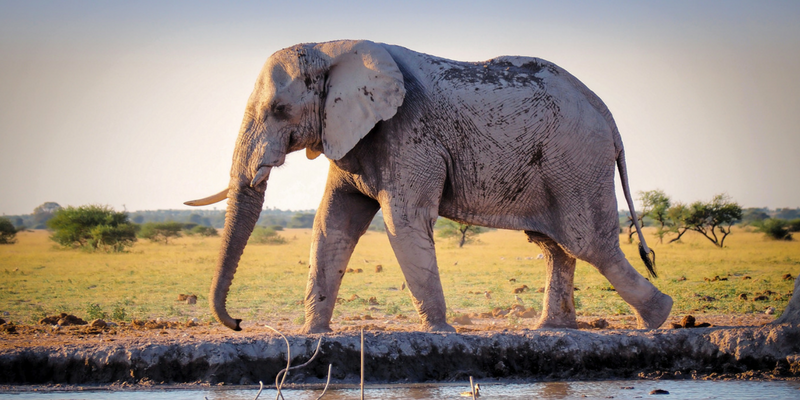 As your child follows the actions to the elephant rhyme, and plays with their streamer in different ways, they will be constantly adjusting their body position and their grip on the streamer. This ability to change body and hand position quickly and smoothly is crucial for more complex skills such as dressing or eating. Working together to make an ‘elephant train’ and singing together develops teamwork, social and communication skills. The slow ‘stomping’ action in elephant pose, allows children to practise balancing on one leg and then the other. Give your child a blue length of ribbon or streamer. Guide your child to hold the streamer in their outstretched hand and to wave it up and down and side to side like an elephant spraying water. Develop speech and language skills by encouraging them to add their own sound effects. Place a bowl or bucket in front of your child. Encourage them to dangle their ribbon into the bucket like an elephant sucking up water with their trunk. Reinforce your child’s understanding of positional language by saying the words ‘up’, ‘down’, ‘in’ or ‘out’ as they do the relevant actions. Wrapping the streamer around your wrist or leg and then waving your arm or leg. Pretending to ‘wash the windows’ with your water streamer. Pretending to wash each other with your water streamers, saying the body parts as you ‘wash’ them. Sitting down and threading the streamer between your toes, then waving your foot in the air to wave the streamer. Provide your child with a short streamer/ribbon (no longer than 30 cm) this means they can control it and are not in danger of tripping over it. NEVER leave a young child alone with the ribbon/streamer. For safety (and to make the movement easier), before starting the seated ‘threading’ activity, guide your child to put their hands down behind them on the floor. This way they can safely support themselves. Also make sure your child is not sitting close to anything which they could bump their heads on as they tip backwards. 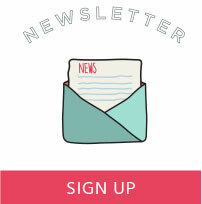 Lower your voice & speak in a slow rhythm to encourage your child to play with you! Stand with your feet hip width apart on the mat. Start taking slow steps on the spot. Really tall – Reach both arms up high above your head. Ever so fat – Stretch your ams out to either side. Do a sorrowful expression and voice. Bring your hands together in front of you – look at them and wiggle your fingers. Encourage your child to copy you. And he has no toes ..
Keep looking and sounding sad but reassure your child by smiling a little! Look down at your feet and wriggle your toes. Stand with your feet hip width apart and stretch one arm up above your head. . Slowly bend forward at your waist (Adults tighten your tummy muscles to control your movements!) & wave your outstretched arm side to side like an elephant’s trunk. Straighten up – then bend forward again to wave your outstretched ‘trunk’ up and down! 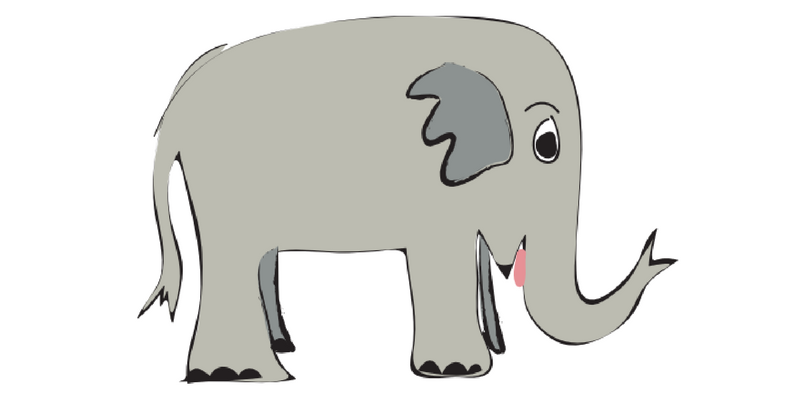 As you play with your child, doing the ‘Elephant rhyme’, you can help them to combat stress and progress their early communication skills. When young children have the chance to actively play with others, they produce smaller amounts of a stress hormone called cortisol. This is helpful because consistently high levels of cortisol have been shown to damage nerve cells in the brain. Hence playful activities appear to protect the young brain. When parents play with their young child, rather than just do a series of movements with them, they tend to use far more gestures, sounds and facial expressions. All of which have been found to aid early communication skills. Try making an elephant train with family and friends by linking your arms through each others’ legs. This helps to develop communication and social skills, while encouraging teamwork.